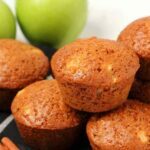 These vegan apple muffins were pretty much guaranteed the moment I made a vegan apple cake! That cake was so good, I knew the recipe would have other uses. So of course I adapted it for muffins. And they were a huge success. 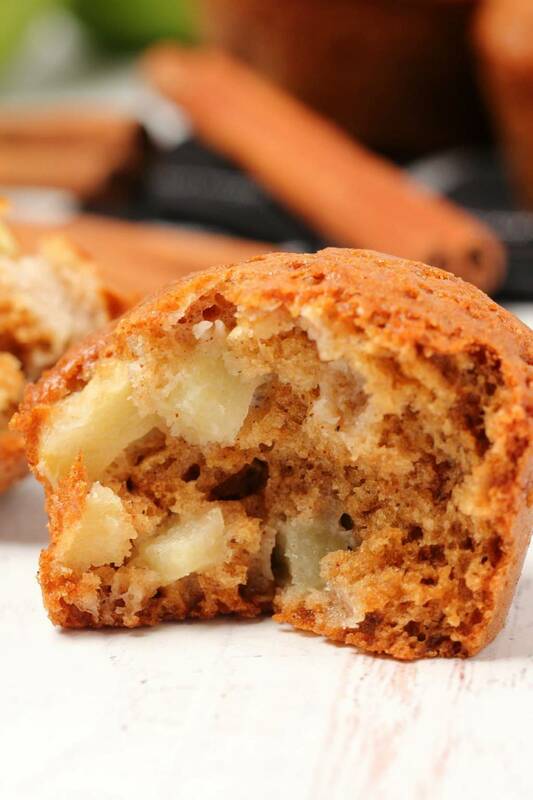 Brown sugar sweetened, cinnamon spiced and packed with whole apple pieces. Truly divine. They’re perfect for a grab-and-go breakfast or just have them for dessert. Making these muffins is so straightforward. Sift flour into a mixing bowl. Add sugar, baking soda, salt, cinnamon and nutmeg. Mix up some vegan buttermilk by adding some lemon juice to a measuring jug and then adding in soy milk and letting it curdle. Add in the vegan buttermilk, some vegetable oil, vanilla, apple cider vinegar and applesauce. Mix everything together. Add chopped apple and mix in. Divide batter between muffin partitions and bake for 30 minutes at 350°F. What kind of apples should I use? Just like with my apple cake, Granny Smith apples will work best here. Granny Smith apples are both sweet and tart and really hold up well in baking. 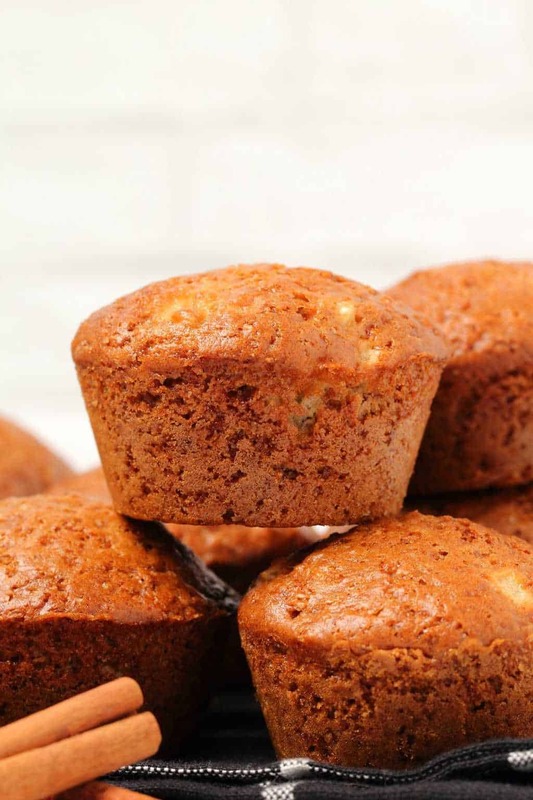 Cut the apples up into fairly small pieces for these muffins, if the pieces are too big they will be too bulky for these (kind of) dainty muffins. Can I use almond milk to make vegan buttermilk instead of soy milk? Yes you can, but soy milk works better. It curdles better and it’s also thicker which means your batter is thicker, which means your apple pieces are more evenly dispersed. 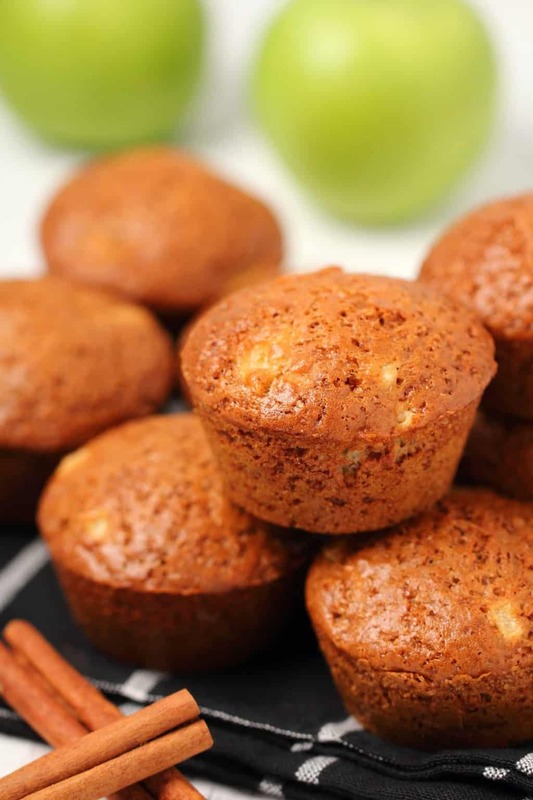 If your batter is too thin then your apple pieces will be more inclined to sink to the bottom of the muffins. In spite of this, yes you can use almond milk if you have a problem with soy but if it’s not an issue either way, then soy will work better. Take a look at our post for vegan buttermilk which has a video and you’ll clearly see the difference between soy and almond milk when making vegan buttermilk. Can I use a different vegetable oil? I have made this with extra virgin olive oil and canola oil. Both worked great. You can use either of those or melted coconut oil or any vegetable oil you like, it will all work well here. However, if you want to use almond milk to make your vegan buttermilk then melted coconut oil would be a better choice in terms of oil so you can keep the batter as thick as possible. 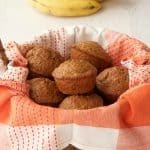 Why do you use apple cider vinegar in these muffins? 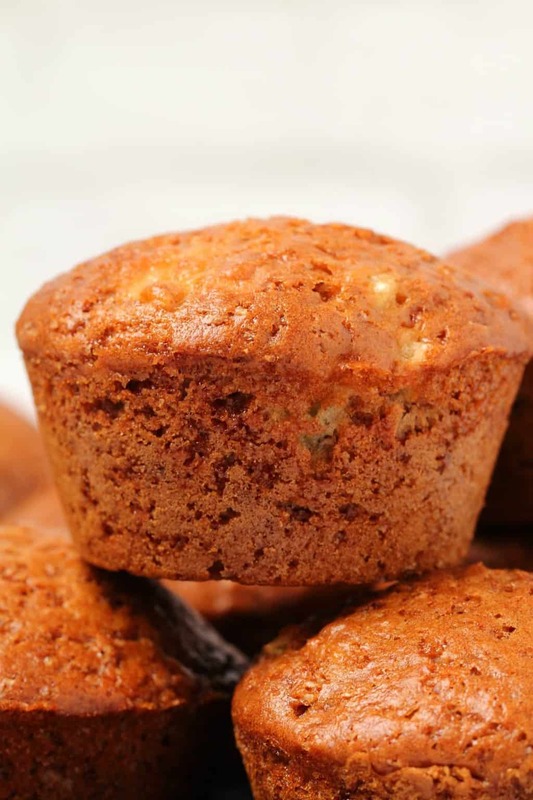 Vinegar reacts with the baking soda and helps the muffins to rise and get that nice dome on top. Yes, we do already have an acid ingredient in the form of the lemon juice for the vegan buttermilk but you definitely don’t taste the vinegar in the end result so I was happy to cover my bases with both. What is your egg replacement in this recipe? I’ve used a bit of applesauce, but there isn’t strictly a need for an egg replacement. Our vegan buttermilk and baking soda/vinegar combo does all the good work here. The applesauce is more for moistness and extra apple flavor. Can I make these gluten-free? You can try it with a gluten-free all purpose flour blend. However, they may turn out a bit dry with the recipe as stated. 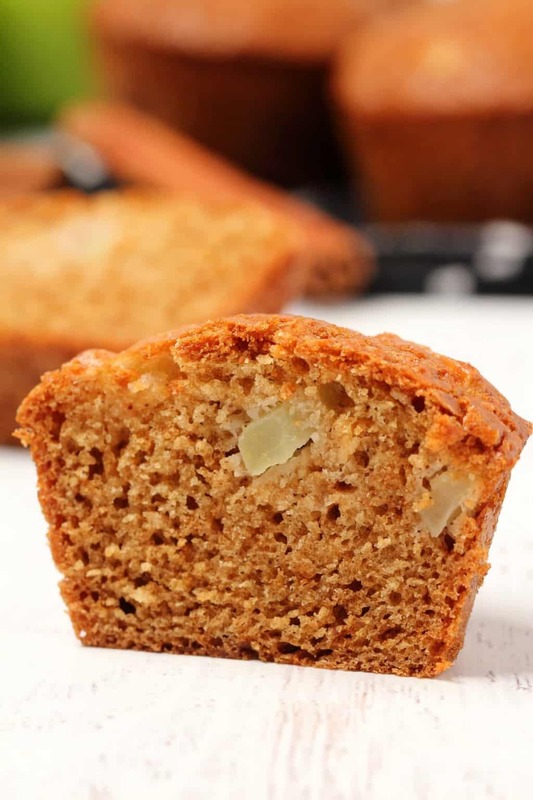 It might be a good idea to experiment with increasing the oil and applesauce a little (off the top of my head, maybe something like an extra couple of tablespoons of oil and an extra couple of tablespoons of applesauce) if you use a gluten-free flour. 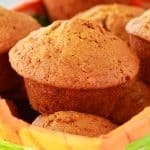 Can these apple muffins be frozen? Yes they can. When you’re ready to have them just let them thaw in the fridge overnight and then bring them up to room temperature on the countertop or microwave them and enjoy! Keep them covered in an airtight container at room temperature where they will stay good for around 4 days. If you want to keep them longer, then store them in the fridge. Let us know what you think of this recipe in the comments and please rate it too, thanks so much! Sign up to our email list to stay updated with all our latest recipes and we’ll send you an awesome recipe ebook with 10 delicious vegan dinner recipes. 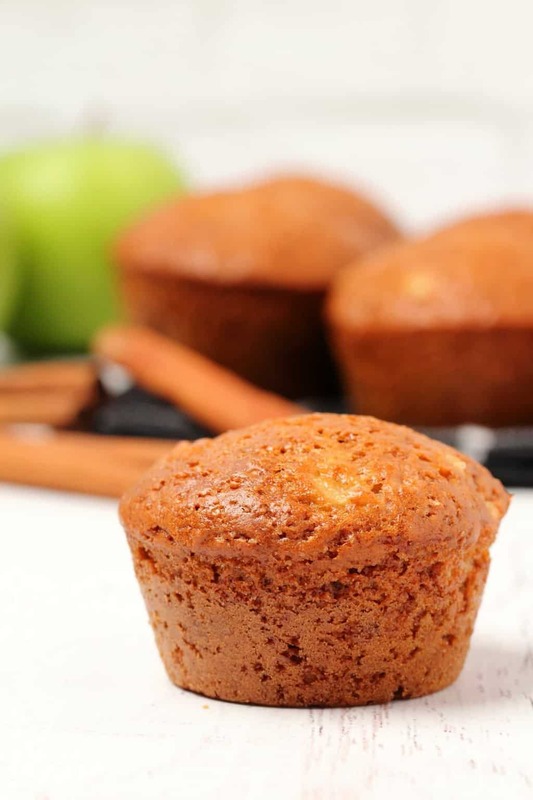 Wonderfully soft and moist vegan apple muffins packed with delicious cinnamon flavor and whole apple pieces. Perfect for breakfast or dessert! Preheat the oven to 350°F (180°C). Spray a muffin tray very well with non-stick spray and set aside. Sift the flour into a mixing bowl and add the brown sugar, baking soda, salt, cinnamon and nutmeg. Prepare the vegan buttermilk by adding 1 Tbsp lemon juice to a measuring jug and then adding soy milk in up to the 2/3 cup line (180ml). Let it curdle. Add in the vegan buttermilk, oil, vanilla, vinegar and applesauce and mix into a thick batter. Add the chopped apples and mix in. 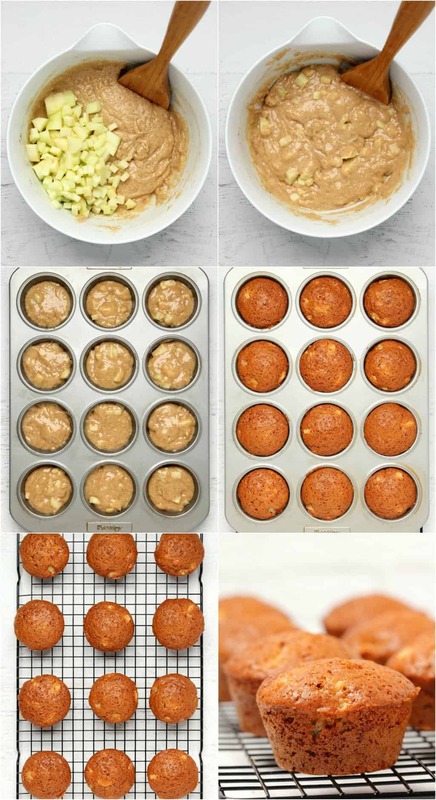 Divide the batter between the muffin partitions. 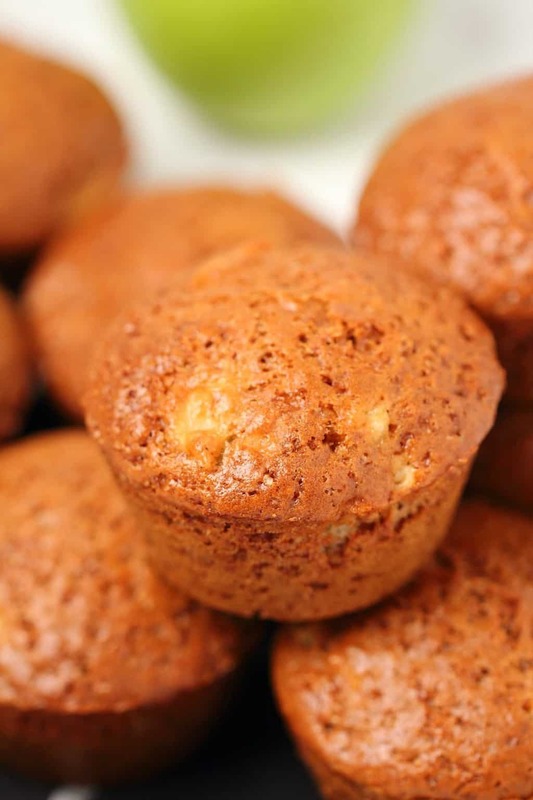 Bake for 30 minutes or until a toothpick inserted into the center of one of the muffins comes out clean. 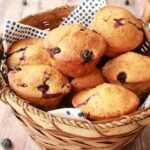 Remove the muffins from the muffin tray and place onto a wire cooling rack to cool. Keep them covered at room temperature and enjoy within a few days. *You can use a different vegetable oil if you like, melted coconut oil would also work well here. 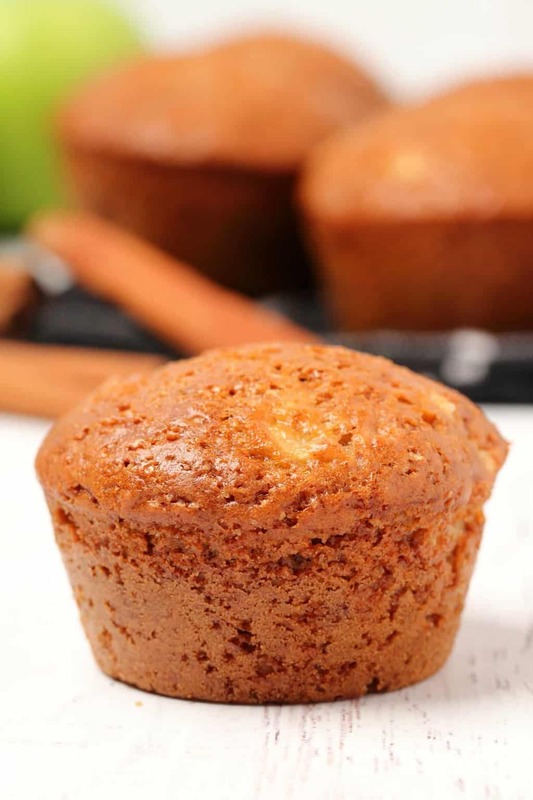 *If you want to fancy these muffins up you can also brush the still warm tops with melted vegan butter and then sprinkle on (or dip them in) a mix of cinnamon and sugar (1/4 cup sugar (50g) and 1/2 tsp Cinnamon). I didn’t think it was necessary as they are really good on their own, though I did try it and it is a very nice addition if you want to add something extra. 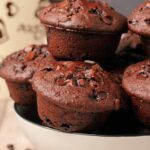 Vegan Chocolate Chip Muffins – Moist and Rich! I’m not sure what I did wrong (I followed the recipe to a tee!) but my mixture was very dry and too thick so the apple pieces were not ‘submerged’ and this resulted in quite heavy muffins. The flavour was amazing and will definitely try again but might experiment with a different oil or add a bit more milk. Thanks Alison! I stumbled across your site and I’ve been baking something new almost every day! Your Classic Vegan Chocolate Cake, the refreshing Lemon Cake, and the yummy Apple Muffins, were amazing ! The recipes worked so well. Thank you so much for these easy to follow and easier to make delicious desserts. Can’t wait to make these! The Apple Cake was a hit and soooooo delicious! Totally perfect muffins. Light, fluffy and moist just like you said. These were absolutely delicious . I’ve been a vegan for 2 years now and my family that aren’t vegans loved them as well. 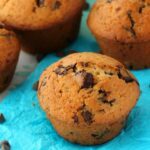 These are probably the best muffins I have ever made. Trouble is they don’t last long in our household – off to make the third batch this week! Love your recipes. Thank you. Mine batter was also too thick. I did use whole wheat flour. Measured but not weighed. I also used almond milk. I used both of those as that is what I had in the house. They are still really tasty but certainly not light. PS i really appreciate the weight measurements as i prefer this to measuring by cups, for accuracy. I used one cup of whole meal flour and one all purpose flour and it came out delicious! Tastes like apple bran muffins which I love. Thank you! They were fluffy and light and delicious. 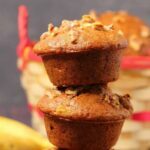 First try at baking muffins, ever… you made it so easy for me, thank you for the great recipe! Can the recipe be made without the oil? Any substitution that would still make it work? Hi there, can I skip the applesauce? Thanks.